New Hampshire never ceases to surprise in culinary adventures. Jorge Arrunategui, a native of Peru, creates paella (pie-a-yah), an amazing Spanish dish, at farmers markets, private parties and other events across the state. He prepares the dish on a portable stove and immense paella pan, which holds paella for up to 100 people. It’s like a theater performance watching him — he occasionally throws in a little operatic aria while he serves his artful presentations. Prep work is done in a commercial kitchen. Arrunategui’s culinary background is impressive. He started in Peru in the kitchen of his mother’s restaurant. He has been in the US for more than 15 years, working as a sushi caterer in Florida, moving on to DC, where he learned Asian cuisine at the Mandarin Oriental Hotel, then on to Hawaii, where he worked on Oahu with the famous chef Nobu. 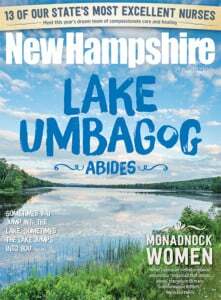 He moved to New Hampshire to take advantage of the Waldorf system of education at High Mowing and Pine Hill for his two children. His wife has family here as well. He is also a talented painter, exhibiting his works in Peru, but returned to cooking when he moved to the US. He creates his paella as he would a painting, mixing the colors and textures of the red peppers, radishes and rice, similar to arborio. He prepares vegetarian paella, as well as the classic Valencia paella, with chicken and sausages. He will do seafood paella, but only for a catered party. Arrunategui is particular about his ingredients. He uses organic chicken and organic extra virgin olive oil, as well as CSA organic vegetables. Everything is of the highest quality; the red saffron and smoked paprika are imported from Spain. His dishes are a feast for the eye and the taste buds. Look for him at the Milford Pumpkin Festival and the Deerfield Fair this fall.